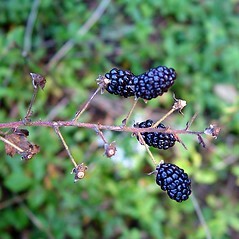 Allegheny blackberry is a multi-stemmed shrub with arching canes that often forms large colonies. 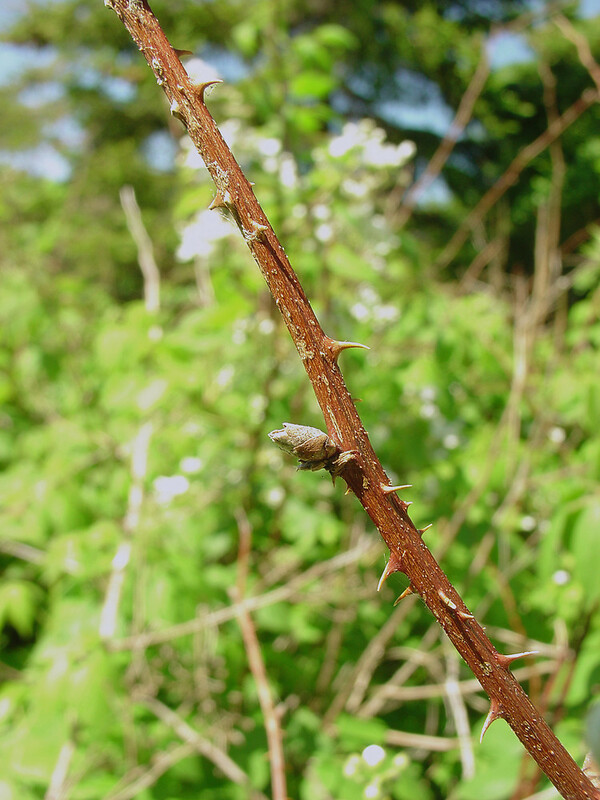 The canes are armed with stout spines and the inflorescence is covered with stalked glands. 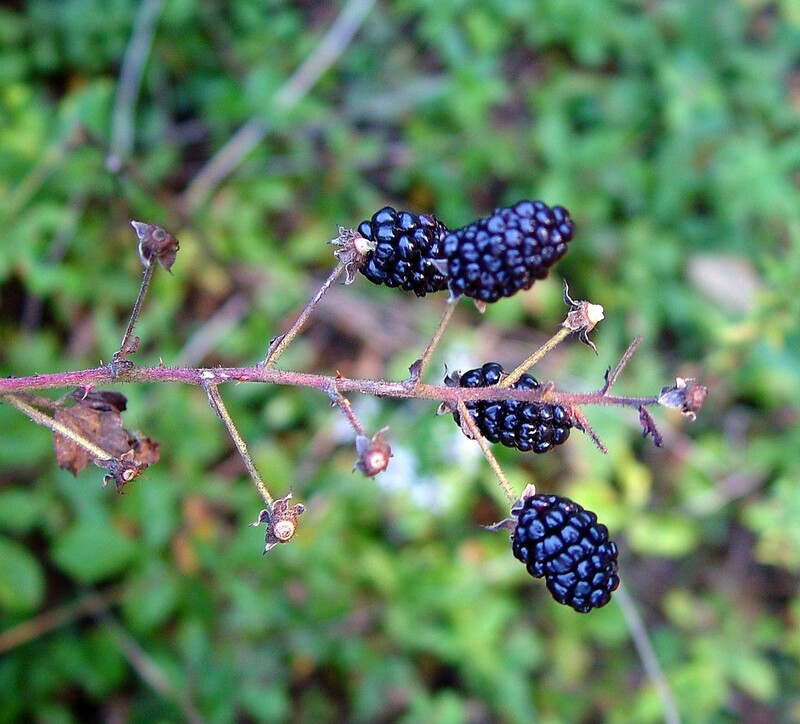 This blackberry produces edible berries that are eaten by many birds and small mammals. 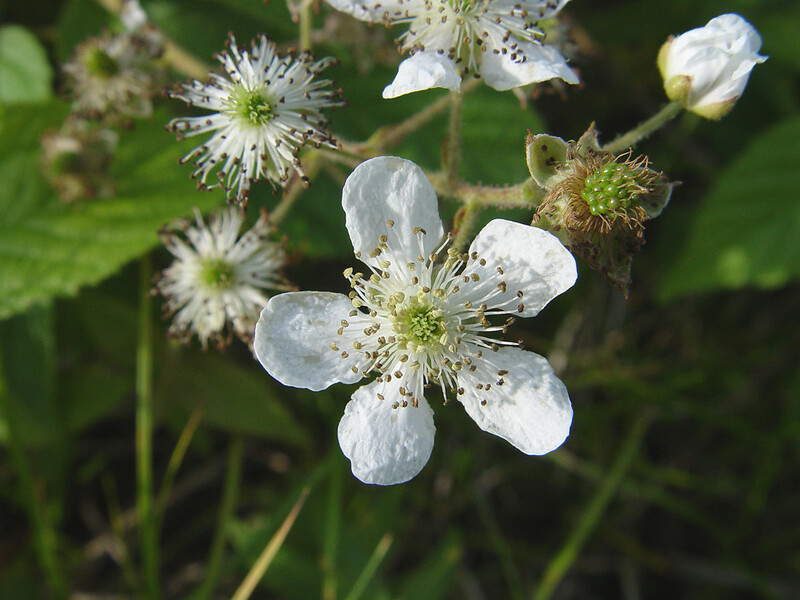 lower surface of leaflets without hairs or with hairs along the primary veins and axis of inflorescence lacking stipitate glands (vs. R. allegheniensis, with the lower surface of leaflets evidently hairy and axis of inflorescence with stipitate glands). axis of inflorescence lacking stipitate glands and inflorescence with usually 7-12 flowers (vs. R. allegheniensis, with the axis of inflorescence with stipitate glands and inflorescence with usually 9-22 flowers). 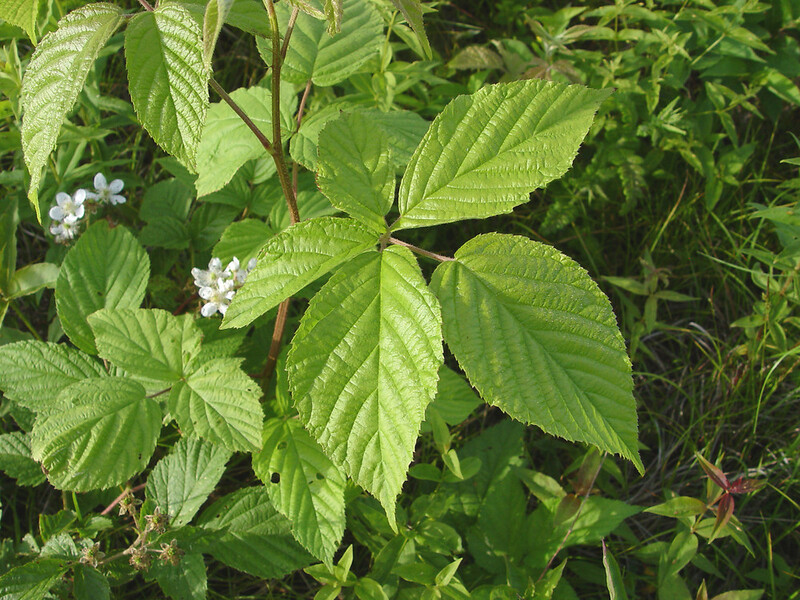 Rubus allegheniensis var. 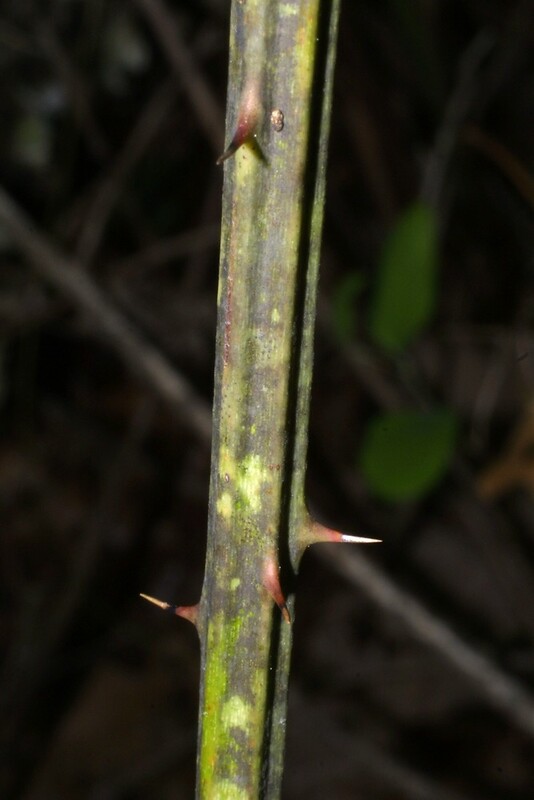 gravesii Fern. 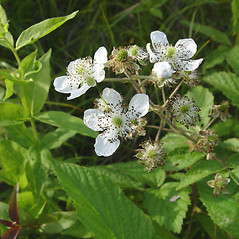 common blackberry. 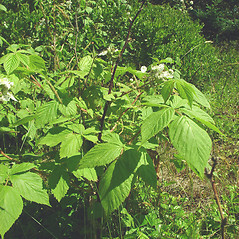 Rubus allegheniensis Porter var. gravesii Fern. 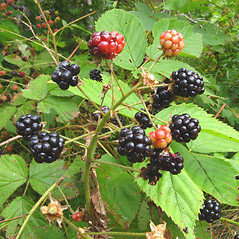 ; R. auroralis Bailey; R. fernaldianus Bailey; R. longissimus Bailey; R. nigrobaccus Bailey; R. pugnax Bailey; R. saltuensis Bailey; R. sativus Brainerd • CT, MA, ME, NH, RI, VT. Fields, roadsides, forest borders, open rights-of-way, logged areas. 1×5. 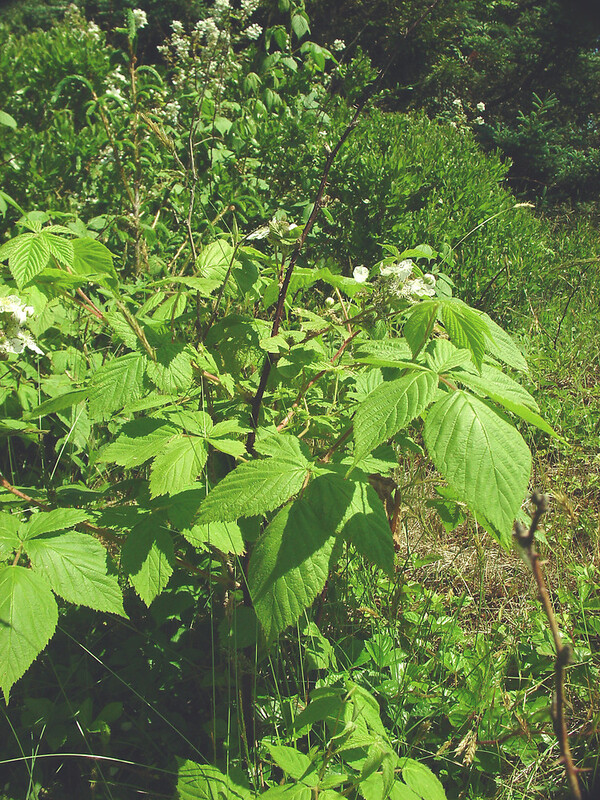 Rubus allegheniensis × Rubus canadensis → This rare blackberry hybrid is known from ME, NH, VT. 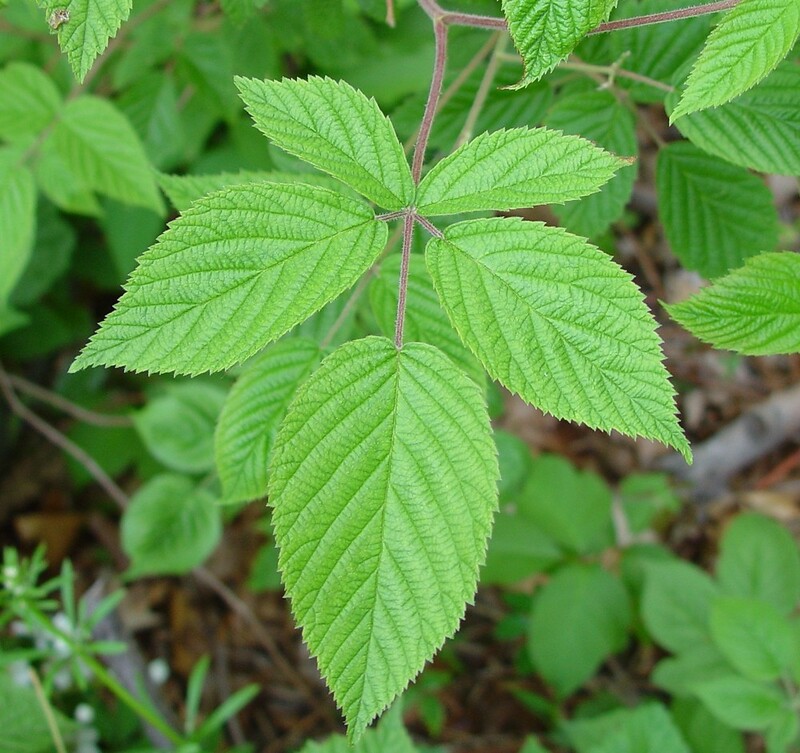 It is marked by stems with relatively thin and short prickles (more like Rubus canadensis than R. allegheniensis). 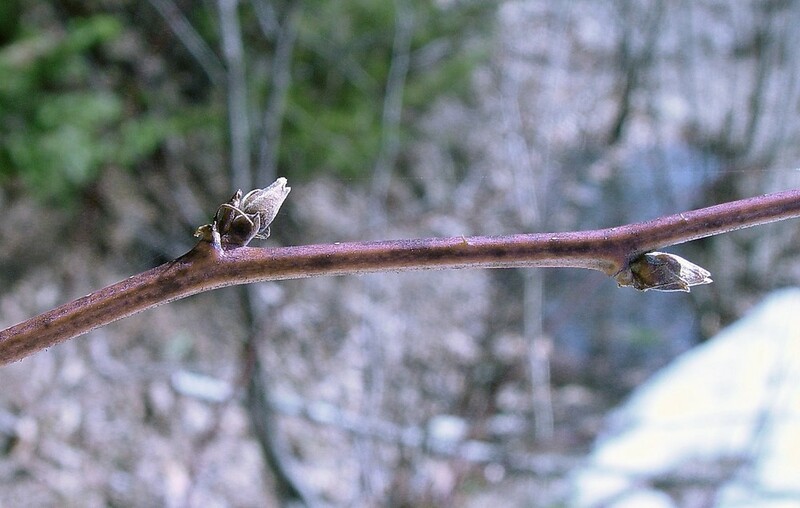 The leaves are pubescent abaxially and tend to be much like R. allegheniensis. 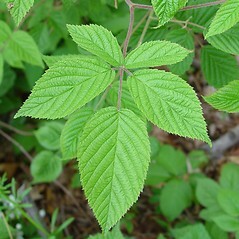 The leaflets of the primocane leaves are with elongate, acuminate apices. 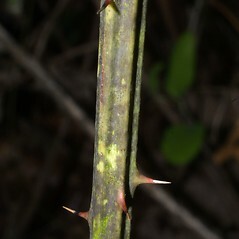 The axis of the inflorescence has occasional stipitate-glands. 1×10. 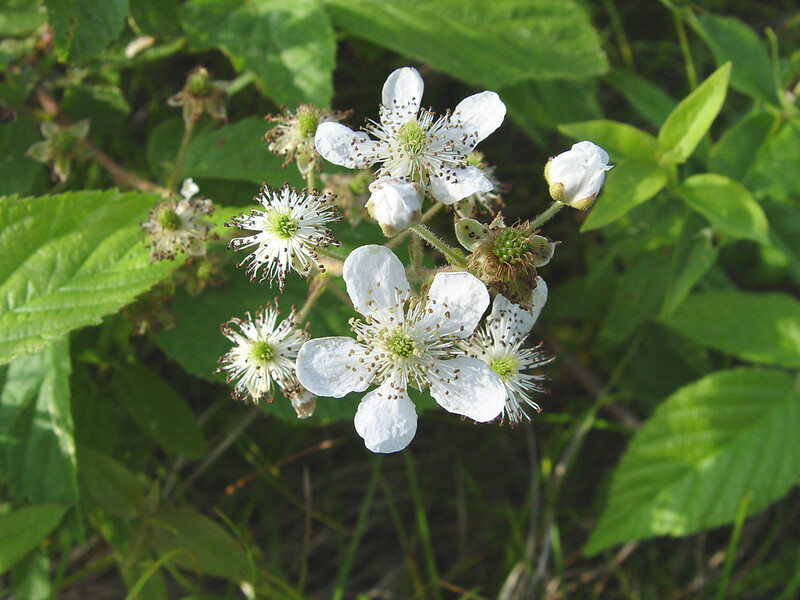 Rubus allegheniensis × Rubus elegantulus → This very rare blackberry hybrid is known from NH. 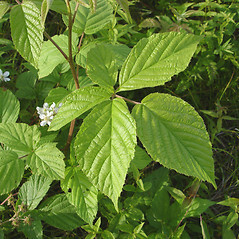 It has leaves that generally resemble Rubus allegheniensis and are pubescent on the abaxial surface, with stems bearing thinner prickles than found in that species (but as in R. elegantulus), and an inflorescence axis bearing stipitate-glands. 1×13. 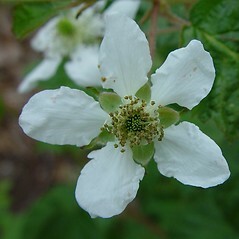 Rubus allegheniensis × Rubus frondosus → This very rare blackberry hybrid is known from MA, RI. 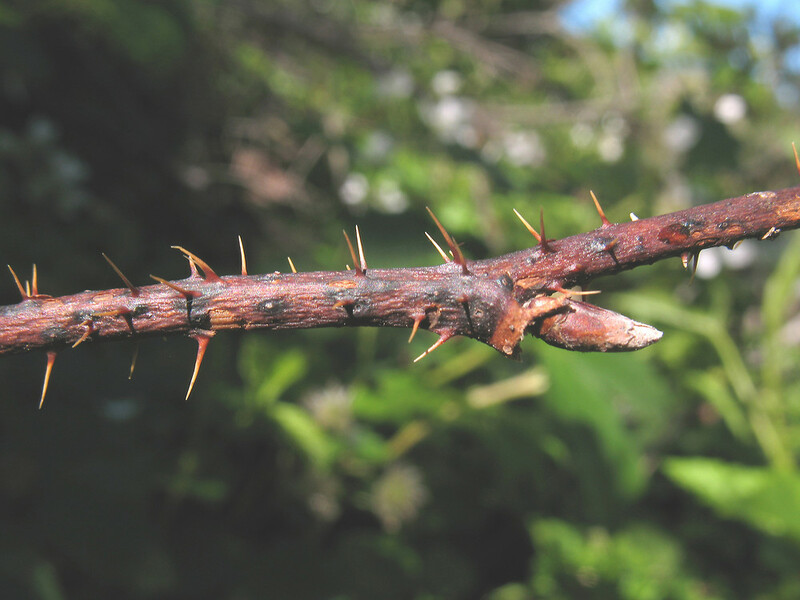 It is marked by stems armed with stout prickles, leaves that are pubescent abaxially, and an inflorescence with scattered stipitate-glands. 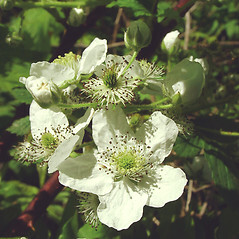 Tentative synonym: Rubus rosa Bailey. 1×14. 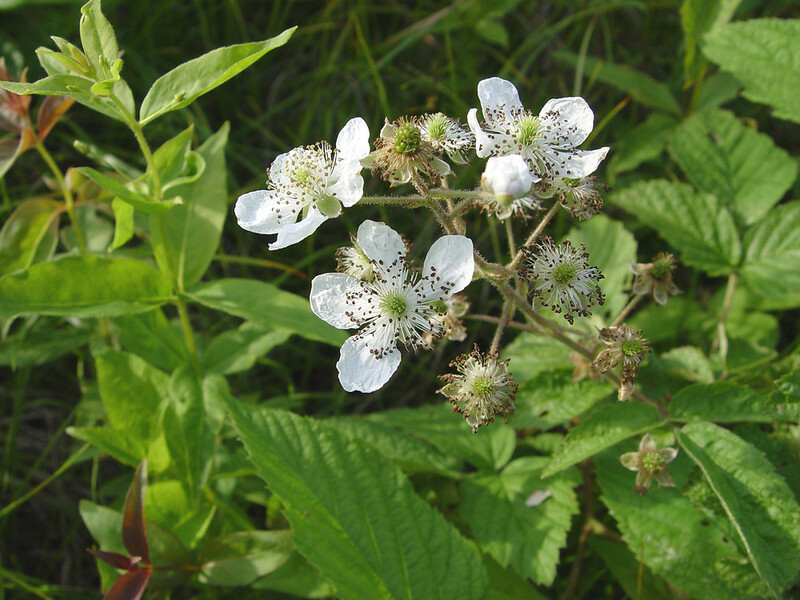 Rubus allegheniensis × Rubus hispidus → This rare blackberry hybrid is known from MA, ME, NH, VT. 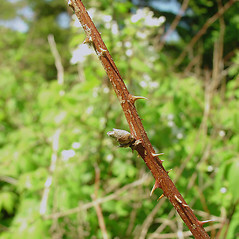 It is marked by variably oriented primocanes (erect, doming, or trailing) armed with both short, stiff, curved prickles (but usually thinner than in typical R. allegheniensis) and stipitate-glands, subcoriaceous and lustrous, ovate to elliptic leaflets that are pubescent abaxially, and a small- to medium-sized inflorescence. 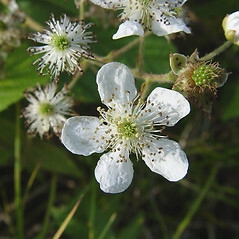 The petals are relatively small (close to R. hispidus). 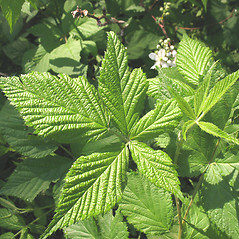 Tentative synonyms: Rubus biformispinus Blanch. ; R. electus Bailey; R. jactus Bailey; R. laevior (Bailey) Fern. 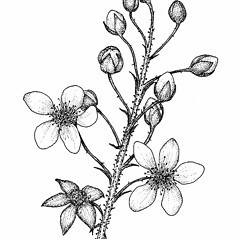 ; R. permixtus Blanch. 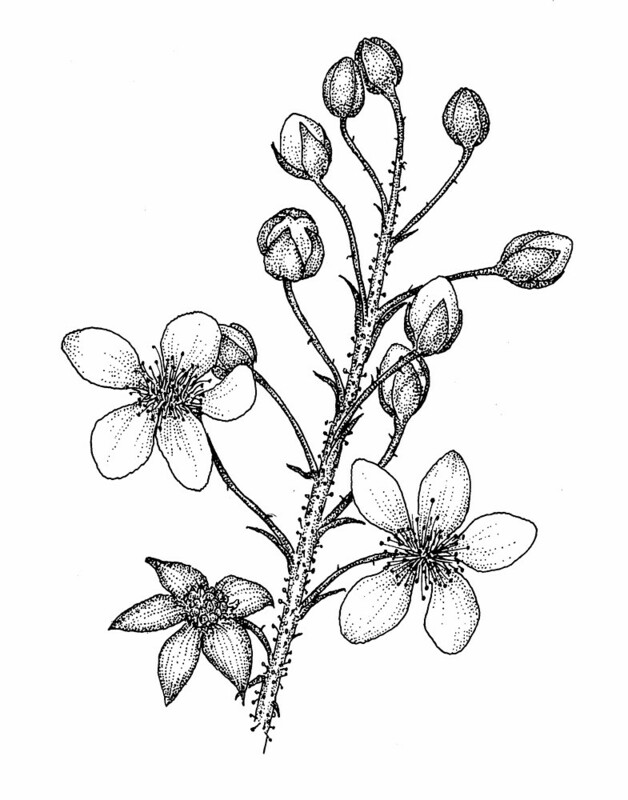 ; R. sanfordii Bailey. 1×22. 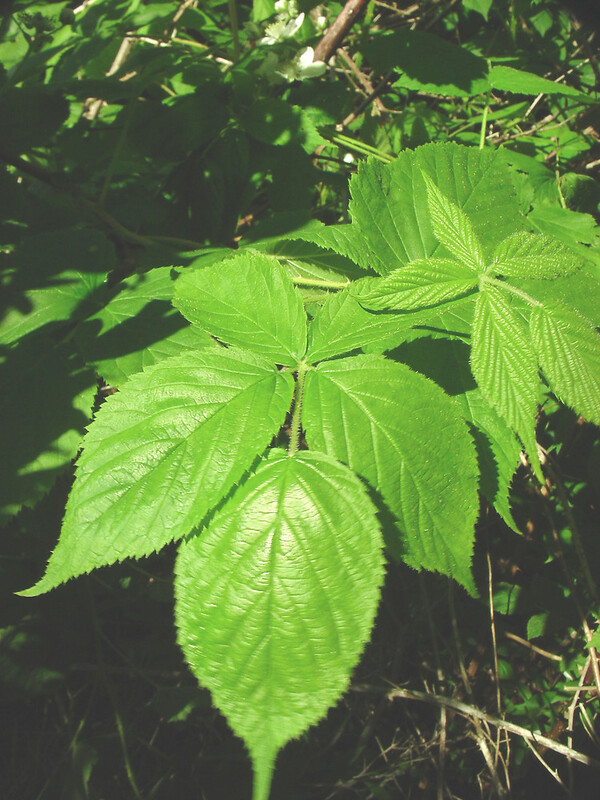 Rubus allegheniensis × Rubus pensilvanicus → This rare blackberry hybrid is known from CT, MA, ME, NH, RI. 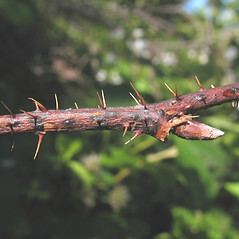 It is marked by stems with scattered, relatively short and thin prickles (compared with Rubus allegheniensis) and an inflorescence with occasional stipitate-glands. 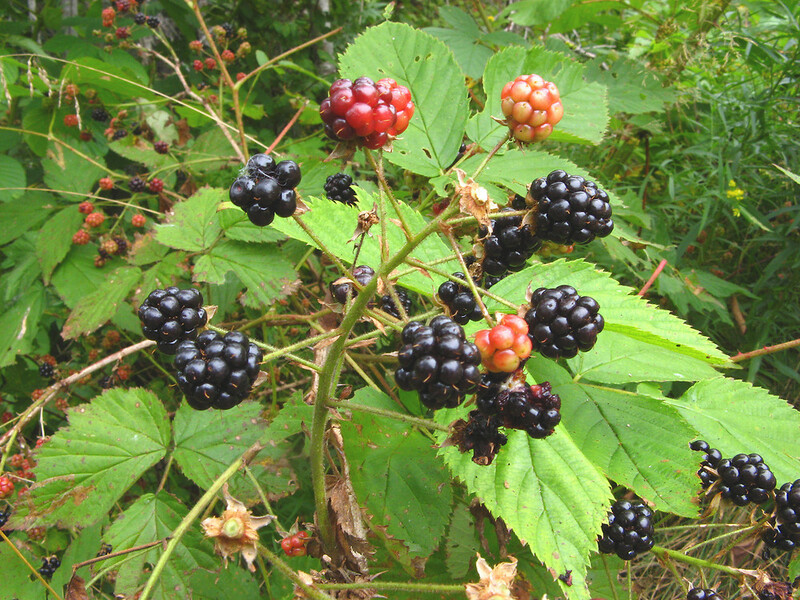 Tentative synonyms: Rubus alumnus Bailey; R. licitus Bailey; R. paulus Bailey. 1×25. 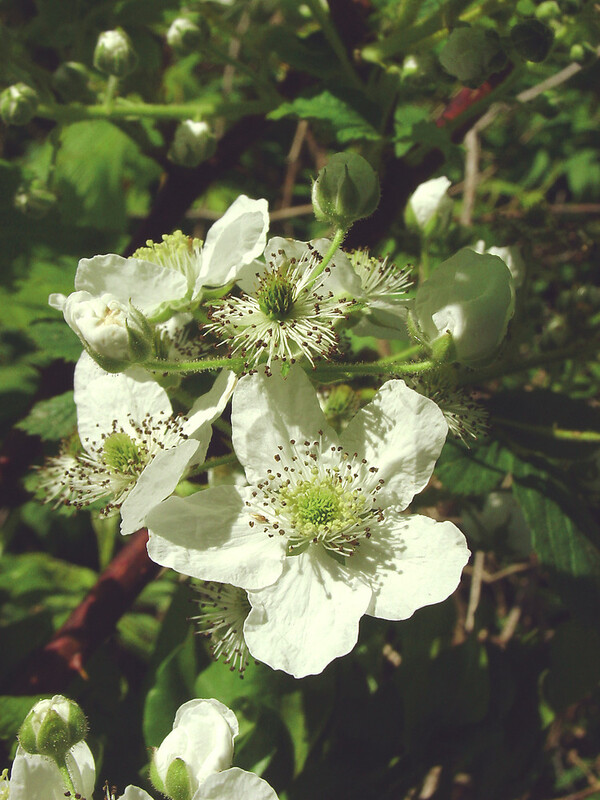 Rubus allegheniensis × Rubus recurvicaulis → This very rare blackberry hybrid is known from ME. 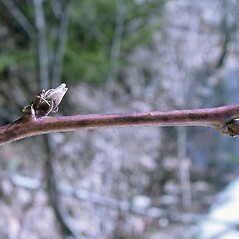 It is intermediate between its parental species. 1×27. 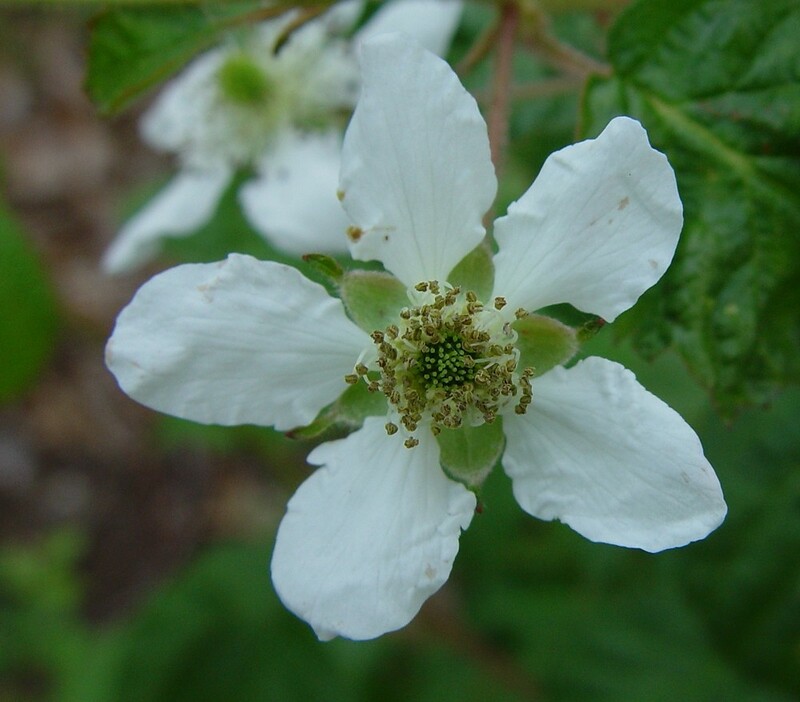 Rubus allegheniensis × Rubus setosus → This uncommon blackberry hybrid is known from MA, ME, NH, VT. 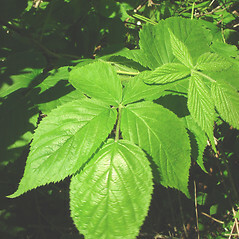 It is marked by arching to erect habit, stems 0.6–1.2 (–1.5) m tall armed with prickles of variable size, slender bristles, and stipitate-glands (small-based prickles and bristles are usually numerous), leaflets that usually resemble Rubus allegheniensis with sparse to dense pubescence abaxially, and an inflorescence that is smaller than usual for R. allegheniensis that has stipitate-glands along its axis. 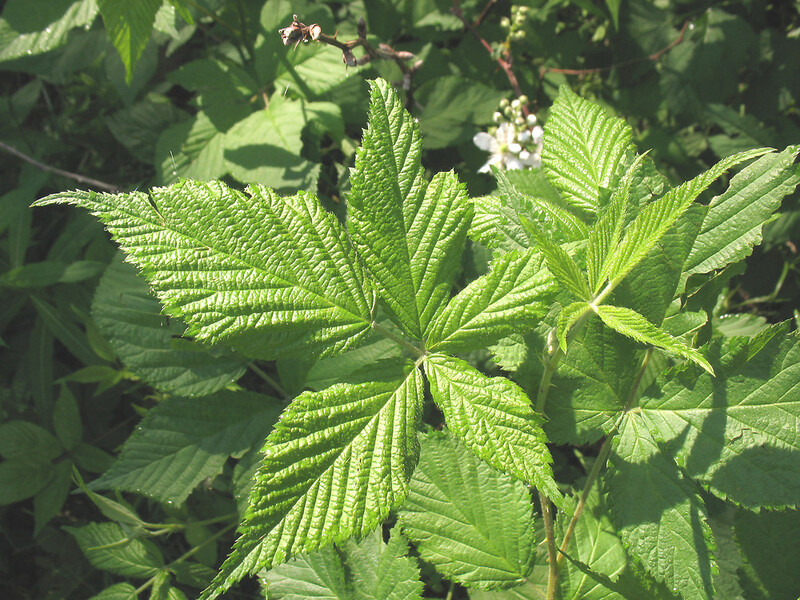 Tentative synonyms: Rubus abbrevians Blanch. ; R. aculiferus Fern. ; R. glandicaulis Blanch. 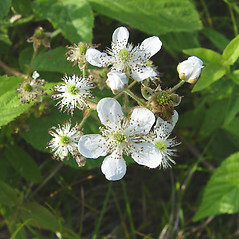 ; R. montpelierensis Blanch. ; R. sceleratus Brainerd ex Fern.